Ramat Aviv: In a move described as “bold” and “daring“, the Ashkenazi Community purchased the rights to the Mimouna Holiday from the Mizrachi Community today. According to the one page flyer that they stuck in the little wooden box on the front of your seat in synagogue, the move has been planned since right after Passover, and was finalized to coincide with the arrival of Shavuot this week. 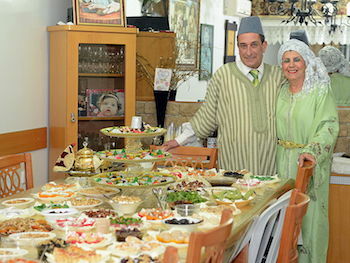 Mimouna, the post-Passover Holiday celebrated by North African Jews, is known for its plentiful food and colorful costumes. And the Ashkenazim vow not to change anything. Except they’re going to make the food a bit blander and easier to digest. And the music is going to be toned down a bit. Especially after 10 PM. Also we’re going to need to make the music slower. And maybe add a fiddle. The Daily Freier stopped by Ashkenazi World Headquarters in Ramat Aviv to get the whole Megillah on this dramatic turn of events. Not surprisingly, this move has led to a few hurt feelings. “This is outrageous!” complained an irate woman named Maygal whom we talked to in the Rehovot train station. “Soon you Ashkenazim are going to take everything we have and make it boring and stupid. How would you like it if we took your Leonard Cohen or Barbra Streisand or whatever and added electronic drums plus sound effects from a dance club and then ran it through the sound system of a 2003 Toyota Corolla with tinted windows?” When the Daily Freier replied that this actually sounded kinda cool, Maygal shoved us and stormed off. In any event, at least there will still be some sort of dance that involves everybody wandering around in a circle. No, I’m serious. Just what must I do to get kicked out of Labour?